The iGEM community page lets you see what some of your fellow iGEM Teams are up to. If you want to add something to this page, send us an email to hq (at) igem . org and we'll add it! iGEM teams if you're thinking of launching a startup, consider giving a lightning talk at the Jamboree's Start-up Showcase! Register to give a 2-minute lightning talk at the start-up showcase during the Giant Jamboree on Friday October 31 at 4PM using the online form. "Team INSA-Lyon has made a music video about the frustrations of cloning! "Team KIT-Kyoto made an introductory video 'How to make basic BioArt.' We hope that more people can find genetic engineering appealing. With a little bit of labware, you can make BioArt!" Team METU Turkey made a game related to their project, and says "PET degredation is a crucial thing but why it cannot be also fun? As an answer to this question, we played a game with some team members and genetics students. In this game, we wanted from people to bend max number of plastic bottles in 10 seconds. Our aim is to tell people about our iGEM concept, our project and synthetic biology in an amusing way. Have fun!" Team SDU-Denmark made a video adventure, and says "People tend to fear bacteria and oppose genetic modification, and thus synthetic biology. Our attempt at a novel outreach approach will teach the audience facts about bacteria, DNA and GMO in a fun and participatory way. - At the burger joint, Mamma’s Burgers, crazy things might happen but it sure will be educational!" Team Pitt would like to share their blog, and in particular, their most recent blog post, with the iGEM Community! Check it out here! Team INSA-Lyon made a video of their team project, "CurLy'on"! Team Evry made a birthday video in honor of iGEM's 10th birthday, and says: ""This is a video which trace 10 years of competitions. Some numbers are real, others are wrong. Will you find the good ones?" Team Colombia says: "This year for our HP project we are trying to find cheaper and easier ways to do synthetic biology. In order to do this, we designed a challenge between teams, where they design iGEM procedures in a cheaper way". Check out their video, and contact the team if you would like to be involved! "iGEM@home is a collaborative platform where volunteers offer their computing power to participants of the iGEM competition to give them the power to conduct novel approaches in Synthetic Biology. You can watch their video here! Team UB Indonesia introduces their team members and project in this video! "We are the members of iGEM Tec de Monterrey and we are ready for the competition. This year we are developing a bacterial therapy against tumorous cancer." Meet the members of Team Tec-Monterrey in their team video! Team Edinburgh asks: "What if artificially intelligent bacteria could be connected together to make intelligent populations? Could we make bacterial computers?" in their team video! Team Imperial participates in the Ice Bucket Challenge! See their video here. ITESM CEM has created a survey about Good Laboratory Practices! "Our Inner Doctor's goal is to provide a complete treatment for the Metabolic Syndrome. As prevention is the best solution for diseases in general, and especially Diabetes, we thought our Human Practices and Policies should also include awareness and prevention work. After research and meetings with experts in the field, we understood that there is a big Diabetes problem in the Bedouin sector in Israel. Bedouins are a subgroup within the Arab minority in the State of Israel, with cultural, historical, social and political uniqueness. We met with Dr. Younis Abu-Rabia who is the first Bedouin doctor in the Negev and a Diabetes expert. Through him we learned that while three decades ago the Bedouins did not suffer from Diabetes almost at all, these days it's considered almost as a plague! The Bedouin people used to be nomads and live a rural life mostly in the southern Negev (close to our university), but in the few past decades modernization has changed everything. This phenomena is common worldwide among societies that used to live a countryside way of life, and are now transforming to the modern lifestyle, such as the Aborigines in Australia. Our answer was the "Metabolic Ambassador Seminar" where medical students from the Bedouin society received the knowledge and motivation to start taking action and raise awareness for Diabetes in their communities. The lectures we organized gave tools and inspired them to keep learning about this subject, and we also handed out brochures in Arabic for them to share within their social networks. To make an everlasting effect, together with the Dean of Students we successfully established scholarships for about 8 students to volunteer in Diabetes Clinics in their communities: helping, treating and guiding patients, while learning much themselves and gaining experience in the process. We also met with the CEO of the diabetes association in Israel and arranged a scholarship a position for a Bedouin student as the branch manager of the association in the southern Negev. Finally, we met with the Director of BGU's School of Pharmacy in the Faculty of Health Sciences who was very enthusiastic about the seminar and said he would organize a similar one next year. Check out their introductory video! Team Valencia Biocampus says: "Our video is a parody of the well known YMCA, in which we describe briefly our project". Check it out! "iGEM BGU 2014 present the complete treatment for the Metabolic Syndrome - The INNER DOCTOR ! 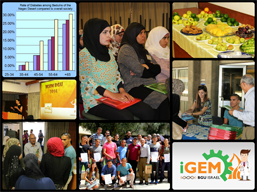 We are group of 10 students forming the iGEM BGU 2014 group, developing using cutting edge synthetic biology technology, a whole treatment for the Metabolic Syndrome." Check out the project video made by Team BGU Israel! Learn about Team ATOMS-Turkiye's ischemia project, "Change of Heart", in their new video! Team Virtus Parva - Survey! Hi there! We are Virtus Parva, an iGEM team from Mexico. We were wondering if you could help us out with a survey we've made? After just 20 surveys we would give you an awesome badge! Here's the link: https://docs.google.com/forms/d/1kTJl6yHHxGvJu9HLSK04_fGdsjFfJnvT9HPyF0S0VWo/viewform?usp=send_form Of course, we could help with any similar projects and we would be grateful if you could pass it on to anyone else that could be interested. Thanks in advance! Team Tec-Monterrey wants to invite all the Latin America teams to participate in a video! Team ATOMS-Turkiye has made a video about the ice bucket challenge for ALS patients! Check it out here. Be sure to watch their teaser trailer and check out their competition website! Check out METU Turkey's team video introducing their team members! Says the team: "We are METU_Turkey team. We work hard and we enjoy our work!" This year, the team iGEM Paris-Saclay decided to conduct a thorough reflection on some issues raised by synthetic biology. As you can see in our summary (I invite you to read it http://2014.igem.org/Team:Paris_Saclay), we are interested in the representation of living. To carry out our project, we have, among others, decided to go to the meeting of ideas: your ideas! We conducted a short survey for you to share with us your view of living and bioart. 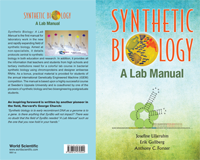 This strong involvement with the use of synthetic biology. Team Oxford made a video about their project: DCMation! Team SF Bay Area DIYbio made a video about their real vegan cheese project! You can support them through their Indiegogo campaign. Check out this video about Team Technion-Israel's project: Safie, the allergen detection system! You can support them through their Headstart campaign. Team Paris Bettencourt made a video about their team, iGEM, and their MOOC project this year! Check it out here! Check out the awesome videos made by this year's iGEM High School teams! For more team videos, see the Community Videos page! "By what can I identify a BioBrick? How do I synthesize DNA? And why is E.Coli involved in that? In the laboratory, scientist create completely new forms of life to simplify our daily life: Bacterias starting to glow when they come in contact with poisonous water, are remote controlled with magnets or they produce rare earths from common household wastes. Within the two days workshop "Down into the Test Tube“ - we want to motivate you to learn more about synthetic biology and the possibilities, but also dangers. For this, we want to bring together people from different disciplines to work together at new solution for future problems. 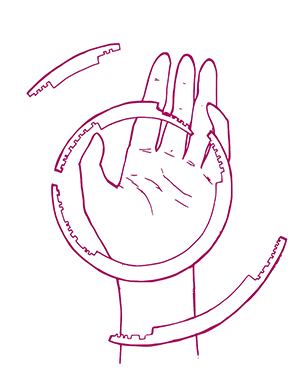 Collectively we play around with paper, scissors and lasercutter to build an analogue, experimental installation, which can help us to understand synthetic biology and finding new solving. Welcome are interested people from all discipline of art and science - special prior knowledge is not necessary. 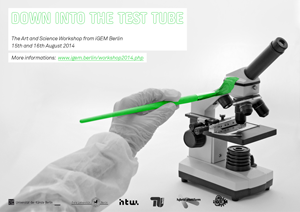 The workshop will be accompanied from scientist of the Berlin iGEM Team. Cost: The attendance is free. Except own materials and individual catering. When: The workshop takes place at 15th and 16th of august, between 11 am and 6 pm. Where: University of Arts, Berlin (Grunewaldstraße 2-5, nearly U-Kleistpark). Available are rapid prototyping tools like lasercutter, 3D printer, and a wood/mechatronic workshop. Arduinos and different materials are in place, but we´re happy when you also can bring a few of your own thinks. To participate, just write us a mail with your name and a short sentence to your person. Questions and suggestions are highly welcome. Team UANL Mty-Mexico shares their project, "The Reprogrammator", with us in this video! Check out the video made by Team Stony Book introducing us to their team via a campus tour! Earlier this summer we, the University of Virginia iGEM team, emailed you about a collaborative survey we had made to help gauge global awareness and acceptance of synthetic biology for future educational and implementational targeting. This is to remind you about the survey, and to let you know that it’s not too late to participate if you are interested. The survey closes on August 18th, and every team that collects 20 or more responses will receive a web badge to put on their wiki that shows their collaborative efforts. Even if you cannot collect 20 responses, any amount helps. As an update, we currently have 28 teams participating from 11 countries, the survey has been translated into six languages, and six teams have collected over 20 responses for a total of 265 responses. Though you may feel pressed for time to complete the survey, as it closes in a month, keep in mind that it only takes around 4 hours to collect 20 responses, and this data could greatly help the iGEM community in the future. If you are interested in completing the survey, please email us at virginia.igem[at]gmail.com for more information, as well as for instructions on how to distribute the survey. "Greetings to all of our fellow iGEMers! We are contacting you to propose collaboration between our teams. We are conducting a survey on peanut allergies and would appreciate it if your team could fill out a simple Google Survey containing seven questions. The purpose of this survey is to examine how aware allergic- and non-allergic people are of peanut allergies and how their society handles and treats the needs of peanut allergic individuals. Please reflect upon the questions before answering them together as a team (no individual surveys, one per team please). Please do not hesitate to contact us if you have any further questions or if you would like to collaborate with us in other ways. We thank you in advance and look forward seeing you in Boston! We made a couple of tools to simplify our iGEM research work and we thought that they might be useful for other teams too. BioBrick Seeker is a simple but powerful tool that searches the BioBricks in the 2014 iGEM distribution. This tool shows the part’s name, description, type, location on the 2014 kit plates and includes the link to the part’s official page on the iGEM website. You can filter the BioBricks by brick type and backbone. You can also search BioBricks by using words that are in their description. We were interested in scents, so 'odor' and 'fragrance' found us some useful BioBricks. There's also a search for the part name when you want to see if the BioBrick you found from the Registry is in the 2014 Distribution. For searching through previous iGEM teams from 2008 to 2013. You can see what has already been done and how similar projects tackled their problems. Both are work in progress and subject to improvements. If you found our tools useful or have ideas for improvement, contact us via Twitter @AaltoHelsinki or send e-mail to team (at) aaltohelsinki.com"
"Have trouble finding biobricks containing or related to a known sequence? Biobrick Blast Online can certainly help you! 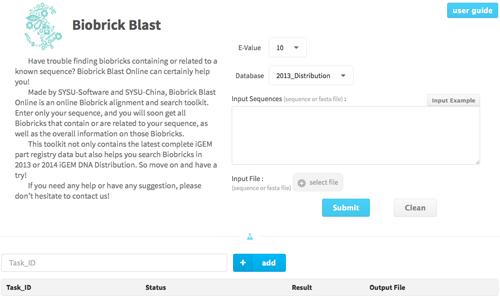 Made by SYSU-Software and SYSU-China, Biobrick Blast Online is an online Biobrick alignment and search toolkit. Enter only your sequence, and you will soon get all Biobricks that contain or are related to your sequence, as well as the overall information on those Biobricks. This toolkit not only contains the latest complete iGEM part registry data but also helps you search Biobricks in 2013 or 2014 iGEM DNA Distribution. So move on and have a try! If you need any help or have any suggestion, please don’t hesitate to contact us at sysusoftware (at) 126.com! The online version of software has been released, and there is also a demo video available." We would like to introduce a tool for calculating cloning plans for assembling genetic constructs. This tool, Raven, inputs a library of parts and target constructs and determines optimized plans for assembling an arbitrarily large set of target constructs with a selected assembly method. The software is freely available at ravencad.org where there are examples files and user videos to demonstrate how to use the software. "My name is Tom Moss, and I am a member of the University of Virginia's 2014 iGEM team. We have designed an online survey to gauge acceptance and understanding of synthetic biology by the general public. We hope that global distribution of and participation in this survey will allow for more targeted public education efforts in the human practices component of the iGEM competition. Participation would involve going to a public place and approaching pedestrians to fill out the short survey. In addition, if your team collects data from at least 20 participants, we will award your team a web badge. This web badge can be displayed on the team’s wiki, and will denote your participation in our study. If you are interested in taking part in the survey, please contact me at virginia.igem (at) gmail.com for further information and instructions. Participate in the iGEM Interlab Study! Can your team measure fluorescence? Do you care about how well your parts work and whether they'll work the same for other people? If so, we invite you to participate in the first iGEM interlab study! The interlab study is part of the new iGEM Measurement Track, but teams from every track are invited and encouraged to participate. Participating is simple: you just need to build and measure three simple constructs. The goal is to find out how these measurements compare between different teams in different labs all over the world. If you want to get a little more in depth, there are extra credit studies to do as well. Can you help us make this the biggest international interlab study ever performed in synthetic biology? Email measurement (at) igem.org to sign up to participate (deadline: July 1st) or if you have questions. Francesca Ceroni (former iGEM judge), Pablo Carbonell, and Karmella Haynes (current iGEM Head Judge) are organizing a new Special Topic issue for the journal Frontiers in Bioengineering and Biotechnology: Synthetic Biology. Frontiers articles are rigorously peer-reviewed, can be disseminated freely and are widely read by your colleagues and by the broader scientific and medical research communities. The aim of the topic “Synthetic Biology: engineering complexity” is to gather views from specialists in the field about reconciling the inherent complexity of natural systems with traditional engineering principles. We are particularly interested in context-dependent behaviors of synthetic systems, and emergent behaviors of synthetic and semi-synthetic systems. We would like to include a broad range of contributions - they can be reviews, research articles, opinion articles, etc. Please contact Karmella Haynes to express your interest in contributing a manuscript. After you respond, you will receive a second automatic invitation for participation from the Frontiers website. If you have any questions, please contact karmella dot haynes at asu dot edu and we will do our best to assist you. Pablo Carbonell – University of Evry"
Team Uppsala - "Synthetic Biology: A Lab Manual"
You can contact them at igemuppsala (at) gmail.com!